During and following the semi-annual major hair loss, you should bathe the dog with a good pH-balanced shampoo especially formulated for dogs. Baby shampoo will do as well, and as long as you don’t wash him too frequently, plain old hand soap is good enough. Bathing will help loosen and remove much of the rest of the dead hair. This is especially helpful if you don’t take time for daily prolonged combing during these shedding periods. On a warm day, soak the dog with a water hose, then work in shampoo or bar soap until you get a good lather, being sure to get the belly, head and neck. Hold the head almost all the while, or the dog will struggle and shake. After he is soaped from ears to tail tip, let him run around for about five minutes while the dirt is emulsified and any ectoparasites are drowned (fleas and ticks will survive under plain water, but cannot breathe in soapy water). By the way, I don’t believe the flea shampoos are any more effective than just letting the dog’s coat stay soapy for several minutes. Then make sure you rinse away every last residue of soap or you will encourage itching and allow dried soap flakes to show later. Soap remaining in the coat will often look like dandruff when it dries, and may even promote moisture retention and hot spots, as will clumps of dead hair that remain wet. The dog can “drip-dry” if the weather permits and the yard is grassy, otherwise he’ll want to roll on the ground and may get muddy. You may want to towel him off thoroughly, using the damp towel over your finger to “ream” out his ears. If you live in the north and must wash him in the winter, you might need to do this in your shower and either way, there are now big warm-air blowers that will literally blow the water from his coat and hasten the drying process. 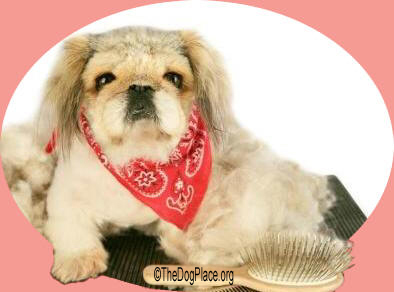 Unless your dog has mites or gets seeds or dirt into his outer ear, the natural production and outward flow of wax will keep the ear lined with a light protective layer, and all you need do is put some tissue paper on your little finger and ream out his ears during your weekly “combing and quality time” sessions. Here are easy, step-by-step instructions, unless you own a cat that grooms ears. 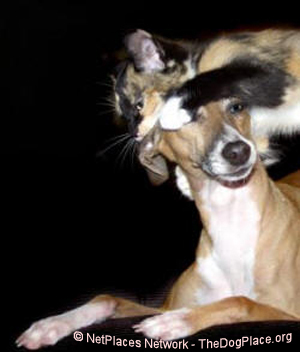 For some reason, cats love to clean ears. (Click image on left to enlarge) If you notice more than the normal amount of wax, get out the ear cleaning kit. This includes rubbing alcohol, cotton, paper towel, and Q-tips™ or equivalent. If you find an infection and/or infestation, use a combination antibiotic/fungicide and miticide. Using the cotton swab-on-a-stick, twirl it in one direction only, on the way into the ear canal as well as on the way out. If you pull off the dirty cotton and twist fresh cotton onto the stick, do so with that same directional motion, or it may come off in the ear. (Click image on right to enlarge) With the dog lying on his side, use the heel of your hand to keep his head down while pulling up on the pinna with the thumb and first two fingers. In this manner, you can partly straighten out the sharp bend of the canal so you can get the swab all the way in. Despite warnings in the popular dog press and elsewhere about touching the eardrum, I have done this for well over thirty years with no problem. With a gentle touch, you can feel the swab bottom-out, and with a firm hand and soft voice you can keep the dog still while you clean the entire outer ear canal. Some dogs lack natural and sufficient hormonal activity to prevent flea-bite allergy, a sign that the thyroid and other glands are not working optimally. There are things you can do to alleviate most of the discomfort and then run tests. The skin, especially in certain areas such as belly, underarms, and pelvis/croup regions, may be hormone-affected but it is the ear that usually is the most obvious place of irritation and symptoms. If the ear canal has an abnormal amount of wax, and if the accumulation is dark and smells unpleasant, it needs cleaning, but you should also attack the immediate cause. The underlying cause may be that the immune system has been damaged from too-frequent and unnecessary 5-in-1-type vaccines. There’s always a chance that the dog may have ear mites, but this is infrequent enough that until you get some miticide or schedule a possible vet visit if you can’t handle it yourself, you’d be wise to treat the symptoms. Some people claim ear-cleaning success with hydrogen peroxide, but I have found over the years that cleaning with a 50/50 dilution of cheap white vinegar does as good a job as anything, and at minimal cost. Wet a thin cloth or a strong paper towel with the solution, and with your little finger ream out the ear as much as you can. Then, while it is still wet, use the Q-Tip I mentioned, and clean out all the channels, then all the way to the ear drum. If you waited too long, and the ear is sore, you will have to persuade the dog that the pain is for his own good, and it will be better in a day or two as the open sores heal. Vinegar has a low (acidic) pH, and that’s what you need because the opportunistic fungus (which is always in the air) does not do well in acidic environments. Do it every day until you can try every other day with success in controlling it. Meanwhile, try to mitigate some of the damage to the immune system by giving vitamin-E supplements. If you do find that the dog actually has a rare case of ear mites, put some of the medicine on the tip of the tail as well, as experienced breeders have long said that the same mites are usually found there, too. In fact, that may be one of the only excuses for frequent bathing until the ear mite critters have been killed or banished. Geriatric dogs that have been damaged by over-vaccination frequently have the same foul, rancid smell emanating from the skin that you had earlier noticed only in the ears. Again, it is probably too late to cure or to erase the damage, but you might be able to control the smell by frequent bathing, a weak vinegar solution rinse, and immune-system dietary boosters. How and why to cut toe nails to prevent foot damage, judges see as neglect. 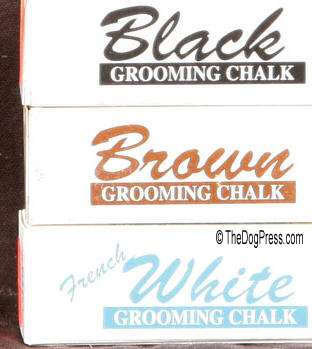 Is the AKC rule on altering coats and foreign substances selectively enforced? 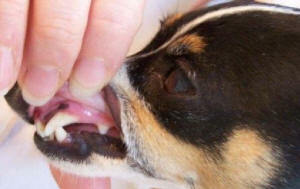 Crooked teeth cause serious problems; prevent painful teething in toy puppies.